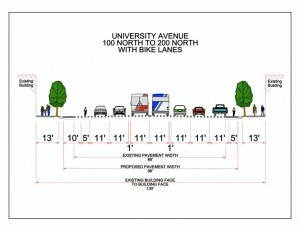 Bike Lanes on University Ave? Here is Your Chance. As many of you may know Provo will be receiving the Front Runner Commuter train as well as a Bus Rapid Transit (BRT) system. What many of you may not know is that bicycles may be kicked off of University Avenue entirely due to BRT. 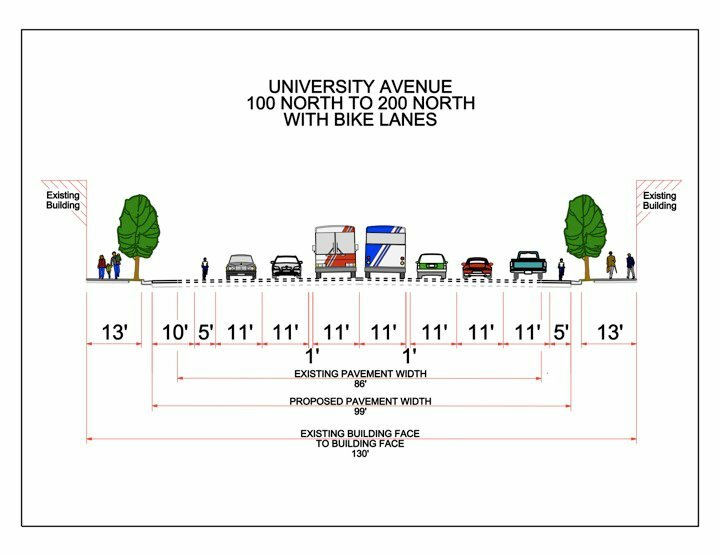 This may happen even though the Bicycle Master Plan which was passed last summer as well as hundreds of Provo Citizens have called for there to be lanes on University Avenue (96% of citizens who filled out the survey said University Avenue was there number one pick). The Bicycle Committee has been working with the City, UTA and the local businesses to make sure this dose not happen seeing as University Avenue is the only complete and safe North/South route in Provo for bicycles. All parties involved have been open, helpful and, cooperative which has kept the process moving smoothly. However, the Committee needs your help in letting the city and UTA know how important this route is for the bicyclists of Provo. Public comment has opened up on the UTA site you can go here to let them know you want bicycle lanes. It will literally take 1-2 minutes and will have a giant effect. I am not sure how long the comment section will be open so please do not delay, this will have a very serious effect on the quality, safety and, accessibility of bicycles in Provo. From there you can copy paste your comments to UTA and send it to one or all of the City Council members here. Once again, all parties have been working together very well but, if all voices are not heard, bicycles (the second largest road user group) could end up losing access to University Avenue. Take a moment and make sure this does not happen. This entry was posted in Bike Advocacy, Bike Paths, Complete Streets, Provo Bicycle Projects, Provo Bike Committee by Zac. Bookmark the permalink. Looks like their comment system is broken (for me anyway). It gave me errors when I tried to submit my comment. I’ll have to try back later. I just went and checked it out. Everything is up and going. Maybe try with a different browser. Thanks for the follow through. I emailed them and sent them a screenshot of the error and will call if we don’t hear back soon. Please don’t give up, folks! Submit a response without an apostrophe or wait until it’s fixed, but please do try again! Thanks Jamie! I omitted apostrophes and it worked like a charm. Jamie thanks for the heads up I did my best to get the word out. I just emailed all the council members with one message. Would it be better to email them individually? I don’t want my message to look like scatter-shot spam. One email to all is just fine. Thanks again for all the great work. Thanks for the tech support! I was having the same issue. You guys rock! Keep sending out the word! Can’t wait to be back in Provo helping out more! Thanks for keeping at it, everyone! I’m really disappointed that they haven’t fixed the form since they have known about this problem for over 24 hours now. That’s a lot of public comment that they’ve lost!